Andrew Card, President George W. Bush's former Chief of Staff, was showered with a chorus of boos and catcalls from students and faculty of the University of Massachusetts while receiving an honorary degree Friday. Protesters, who caught the embarrassing scene on video, attached anti-Card signs to their robes and drowned out Provost Charlena Seymour's remarks about Card's "public service." Even faculty sitting on stage joined in on the action, screaming their disapproval while holding signs that read "Card: No Honor, No Degree." Card, obviously shaken by the commotion, managed a slight grin while Seymour spoke. He later raised his hand in recognition but sat down without speaking at any length. After the ceremony, he refused to acknowledge the protests, only saying, "It was a great honor and a privilege to be here." The university community was upset with the school's decision to award Card an honorary degree, given his involvement in spinning intelligence in the lead up to the war in Iraq. Even before the ceremony began, 100 faculty members and students sang anti-war songs, handed out leaflets and waved signs outside the arena where commencement was held. A graduate of the University of South Carolina, Card was a supporter of UMass in his days as a Massachusetts lawmaker. 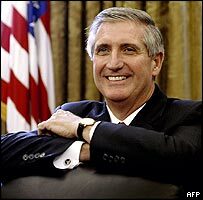 He served as Bush's chief of staff from the president's first inauguration through 2006. The video below was created by the protesters.